his crew of eight pounded Nazi targets, especially over German-occupied France. But this humble hero was so quiet that his most daring sortie was kept hush-hush from even his children for almost 70 years—14 years after his death. Six months ago, a cousin, Allen Miles, dropped this war-story bomb on the Army Air Force officer’s three children, Susan Roberts, Frank B. Roberts Jr. and Jane Roberts Robertson. Susan was the first to hear the 1945 story, sending shockwaves through the family. How could they not know this? Like so many other war heroes, Frank didn’t talk about his exploits. He did his part. He survived. He came home to his young wife’s arms. And, as a member of The Greatest Generation, he helped kick-start America’s middle class in the post-war economic recovery. But as my friend Jane recounted the details of her dad’s bold mission, the retired elementary school principal is still mystified by his silence. But she’s grateful a cousin revealed this death-defying saga that could have been Hollywood-scripted for John Wayne. In Adolph Hitler’s quest to stomp his hobnail boots in the free world’s face, the dictator was ruthless in his attacks on France, England, Poland and other European countries. America’s mother country was proud when her offspring showed up to challenge the bloodthirsty bully. And that’s what Captain Roberts and his seven airmen were doing when they lifted off from Podington, England. But it was somewhere over France that “they took on fire,” Jane says. With smoke pouring from the plane, the Americans ejected, Capt. Roberts being the last. At least one crew member was known dead. Two reportedly escaped and slipped back to England, with the help of Frenchmen. The fate of four others was unknown, but Capt. Roberts landed in a ditch, near a German-occupied airfield. Hearing planes above and tired of hiding, he reportedly walked into a hangar—“like he owned the place.” There, he spent the night. At sunrise, Roberts heard an engine running. Peeking out, he spotted an observation plane warming up on the tarmac. The cockpit was empty. Snitching a German flight suit and hat, he strolled onto the runway and climbed into the plane. An unsuspecting ground attendant removed the chocks, and the American pilot roared off, England-bound, in an enemy plane. The University of Kentucky-educated civil engineer must have been a savvy salesman, because, instead of being shot, the trigger-happy Brits hauled him off to jail. Finally, American soldiers showed up with dental records to verify Frank Bryant Roberts’ identity. 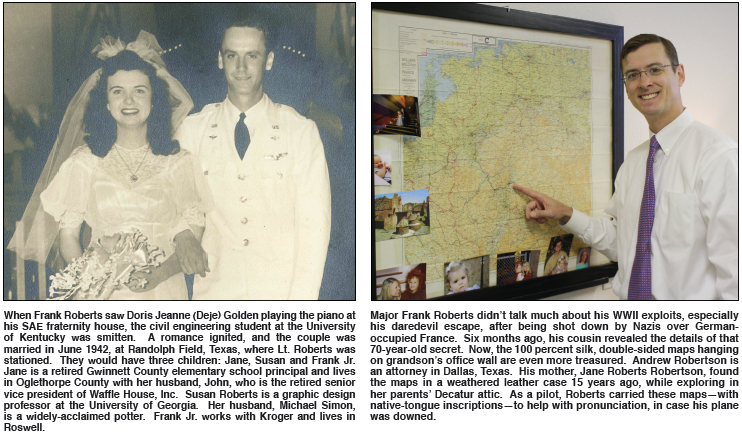 When Germany and Japan surrendered, the bluegrass-state flyboy walked away with decorations for his 16 missions, including two oak-leaf clusters and a promotion to major. But before he reunited with his beloved Deje (Doris Jeanne), the couple’s first child, Jane, was born—prophetically on May 8, 1945, VE Day. Despite the secret’s aftershock, Jane, Susan and Frank Jr. have one new blessing to add to their prayers. If Frank Roberts—the unpretentious man they admired as a gung-ho golfer, straight-arrow real estate appraiser and civic-minded, poker-loving, joke-telling, chili-cooking, bridge-playing, Decatur Presbyterian deacon—hadn’t been a gutsy daredevil, they wouldn’t be bowing their heads around this year’s Thanksgiving tables.